Chief of Police Clint Herdegen told Bollyn, on August 17, that he had sent this unit to their house to explain. Why would the C.O.P. send the suspicious vehicle with out-of-uniform armed men, the very cause of Bollyn’s concern, back to his house? How could this be not seen as extremely provocative? 20:03:11 Off. Wesley Schulz (6190C) is en route to Bollyn house. At this point, no fewer than eight police officers in 5 vehicles are en route to handle Bollyn’s non-emergency call about a suspicious vehicle. Questions: Why are so many officers involved? What’s going on here? Are they all responding to the false claim made by the police that a fight is in progress? Questions: After Bollyn was arrested, police told Jay Bollyn (Bollyn’s older brother) at the scene that this was a tactical unit involved in “gang-suppression,” although there is no gang activity in the neighborhood and never has been. A month later, Lt. Joseph Perritano (HEPD) said this unit was actually engaged in “cross-training.” The police report says that this unit had just made a traffic stop down the street prior to coming to Bollyn house. So, what exactly was the mission and purpose of this unit? Note: As C.O.P. Herdegen explained to the Bollyns, in a recorded conversation, the paramedics are called when somebody has been TASERed. This doesn’t make sense because nobody has been TASERed and at this point the police are only responding to a non-emergency call about a suspicious vehicle. (August 17 meeting at Village Hall). Herdegen is also contradicted by Deputy Fire Chief Robert Gorvett (HEFD), who told Bollyn that the department doesn’t even have a policy or guidelines about how to treat TASER victims. Question: We know that the paramedics are on the scene because the 911 dispatcher overheard police saying there was a “fight in progress.” Why did C.O.P. Herdegen tell this lie to the Bollyns? The medics were not called because of the TASERing, because this had not yet occurred. Note: The “back in service” notification was given before the tactical unit assaulted and TASERed Bollyn – something they witnessed. 20:04:43 In the shadow of the Bollyn’s maple tree, Officer Fitzgerald, the uniformed officer originally dispatched to handle the 911 call, logs in as “on scene” as he quietly pulls up beneath behind the unmarked car (6744). Fitzgerald remains in the car, however, and watches the assault. “It’s underneath of me,” Bollyn says and tells Helje to get his brother Jay (from the house) and Dale, the neighbor. Stoy uses a pressure hold, kneeling with his full body weight (about 200 lbs.) on Bollyn’s right temple. He continues this painful pressure on Bollyn’s head, used to paralyze the person, for about two minutes. Meanwhile, Barber kneels on Bollyn’s right elbow, which is most likely the cause of the occult fracture in his elbow. 20:05 (Est.) Barber places TASER weapon (Model X-26) directly against Bollyn’s lower back. Bollyn is TASERed with 50,000 volts for several seconds. No verbal warning of any kind was given prior to the TASERing. Bollyn’s wife notices that her husband’s face has turned purple and that his eyes are bulging out of his head. He appears to have great difficulty breathing. Note: Barber’s comment indicates he has been prepared with information about the Bollyn family in advance. Mrs. Bollyn attempts to photograph the assault but is physically blocked and threatened with arrest by Off. Felgenhauer. She is thus prevented from documenting the event and obtaining evidence of a crime, for example of the body armor vests of the three men, which the police claim had “POLICE” written on them. All three Bollyns claim that the vests had no visible police insignia. Questions: Was this the “cross-training” Lt. Perritano spoke about? Did the police make a video of this assault? “Are you going to bring her back?” Mrs. Bollyn asks anxiously. 20:06:30 (Est.) Bollyn is taken, handcuffed, and placed in rear seat of Fitzgerald’s car (6131C). 20:06:40 (Est.) Christopher Albert, Bollyn’s 11-year-old son comes home to find a huge police presence in his front yard and see that his father is being taken away. He becomes hysterical and needs to be calmed down by his uncle and his mother. Off. Lawrence who works with juveniles, witnesses the scene. Schulz approaches Fitzgerald’s car. Fitzgerald tells Bollyn, “See this guy? He is going to beat the —- out of you.” Fitzgerald made several similar threats that Bollyn would be beaten at the station. Note: Had the medics examined Bollyn at the scene, they would have seen that he was not drunk or on drugs, as the police report claims. No tests were done to determine Bollyn’s condition or extent of injuries. During this trip Fitzgerald continued to abuse and threaten Bollyn. When Bollyn would lean toward the Plexiglas window between the front and back seats, Fitzgerald would suddenly slam on the brakes causing Bollyn’s head to strike the window. This happened at least twice. “You take care of him now,” Fitzgerald says. When the police start to remove Bollyn from vehicle, he says he is a journalist and will write about the “treatment” he receives. 20:20 (Est.) Bollyn is Processed at Station – Bollyn’s floral shirt is ripped off, tearing the shirt and sending the buttons flying. He is fingerprinted, photographed, and placed in a cell in which the water has been turned off. When he asks Fitzgerald for a glass of water, he is told, “Drink from the toilet.” Fitzgerald is clearly aware that there is no drinking water in the cell. Asked why the unit had prowled around his house for two days in a row, Fitzgerald says, “We are watching you.” Two other officers are with Fitzgerald when he says this. 22:00 (Est.) Off. 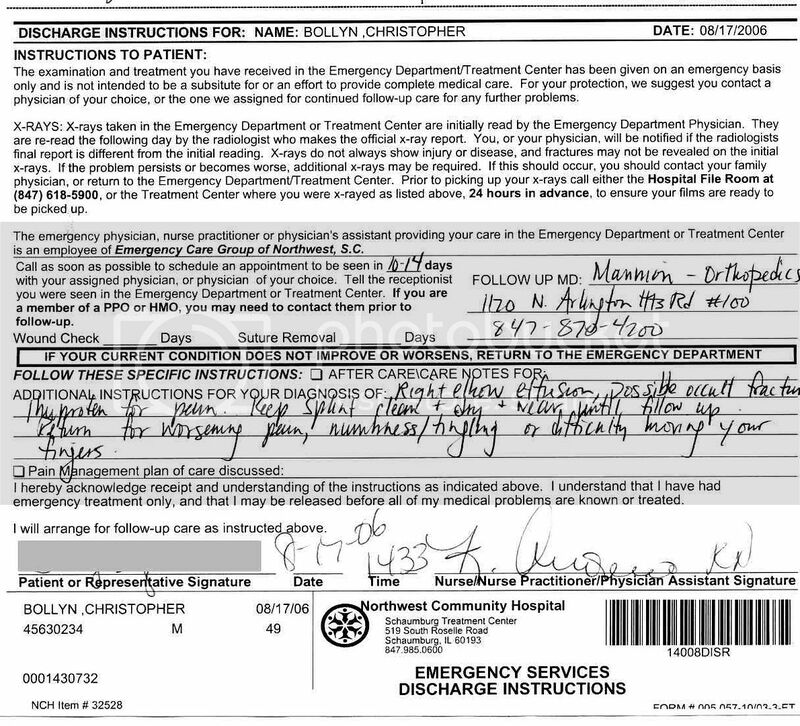 Schulz comes to Bollyn’s cell, where he is being held without water or medical attention, and told that because he has been TASERed, medics would have to examine him. 23:50 Bollyn is released after posting $100 bail and walks 4 miles home with untreated fractured elbow. Bollyn’s elbow is X-rayed on Thursday and effusion indicative of occult fracture is found. His arm is put into a cast and sling.